The recent Wise Traditions Journal was jam-packed with real foodie goodies. Recently I posted some yogurt cheese recipes to help you get more probiotics into your diet. (Or find probiotic supplements here.) Today I’ll share another excerpt from Jen Allbritton – some ways to use whey. Whey is the tart, golden liquid known to the Greek doctors of antiquity as “healing water.” In fact, Hippocrates and Galen, two founding fathers of medicine, frequently recommended whey to their patients. Whey from fully fermented milk no longer contains lactose, and with its dose of probiotic organisms will help maintain a synergistic balance of the inner ecosystem and encourage repair of gut dysbiosis (abnormal gut flora…another way of saying ‘not enough healthy bugs in your gut’). Whey also contains a fair number of minerals, particularly potassium, and a notable amount of vitamins, especially B2. So what do you do with all your nourishing whey? Drink it straight or mix it in with a fermented beverage or hot tea. Freeze whey into ice cubes and blend them into smoothies for a more slushy texture or cool-down a beverage on a hot day. Replace a portion of the water used to cook grains. Lacto-ferment almost anything – apples, zucchini, cabbage, cherry chutney, ginger carrots, mayo – see Nourishing Traditions Cookbook by Sally Fallon and Wild Fermentation by Sandor Ellix Katz. Feed to pets – chickens, dogs, cats, they all can benefit from this nourishing liquid. What else do you do with your whey? OH, I thought of one more thing I use it in: Real food protein shakes! Here's how to use it to preserve homemade mayo! I heat my milk to 160 and then turn to low and hold it there for 20minutes stirring periodically. I then let it cool to 110 and add the starter. I ferment for 8 hours, and then my yogurt maker automatically switches to COOL. I let it sit there for 2 hours and then put it in the fridge. I have been make yogurt and kefir. At first I would add the whey to beans or soups but then I found a recipie for a soft drink that I believe comes out of the Nourishing Traditions book. I juice a dozen lemons, add 1/2 cup of sugar and 1 cup of whey into a gallon jar and top it off with filtered water. Cover with a paper towel and rubber band or just place the lid on loosely. Let it go for two days. You can also do the same with orange juice. I use a pint of the not from concentrate instead of the lemons. I bottle them in flip top liter bottles. And let them go another day to three days. They don’t make it past that because they all get drank. I have mixed the two 50/50 during the bottling and that is my favorite. The sugar has been used up in the fermentation process. After the second fermentation the fizz nicely. But the fizz doesn’t last as long as a store bought soda. But this is a healthy soft drink full of probiotics instead of high fructose corn syrup. I highly recommend. Yes! Let’s get down with some answers here about the shelf life of whey and what one can expect the longer it stays in the fridge. There is a fresh phase, then a slightly sour stage that is confusing to me because what may smell bad to one person, may just be sour to another so the advice of “throw it out if it smells bad” doesn’t really help much. What about using it for lactofermentation in making ginger beer when it is sour? Isn’t that what lactofermentation is about? Souring? So at what point does the whey become unusable? Is there any danger of food poisoning or botulism if you let it sit too long? I wish someone could find out and let me know!!! Thanks and happy cheese making. Yes, I’m also curious how long whey should last in the refrigerator. I have read really different time frames. Some post say up to 6 mths in a mason jar, while others say 1 week. This is a huge difference. I would be curious to hear other’s experiences. Thanks so much. I need some help. I just went to use some whey that I had in the fridge and it was moldy. It has happened once before after 5 months or so. This time it was after 6 weeks. I have read it should last quite awhile. The whey was made the same way I have always done. I make homemade yogurt from raw milk, strain it through a flour sack towel or coffee filter and put in a mason jar in my fridge. Hiya! Thanks so much for such great info. I’m new to yogurt making and have learned so much from your site about whey and uses. I wondered though, if cooking of freezing of whey kills of some of the goodness of the whey? Or does it make it even stronger? I know probiotics are temperature sensitive, so I couldn’t help but be curious about this. Do you happen to know? Thanks so much for such a useful site! New to all this, but I wanted to ask if anyone knew the nutritional information on raw whey…? I am an active athlete and have been moving more toward whole, natural foods – raw milk for example. In doing so, I’ve begun to think about the option of replacing my Whey protein powder with raw whey… What’s the comparison of protein in raw liquid whey to say Muscle Milk? That would be a MUCH healthier option for you than the protein powder shakes, and you can just drink as much as you’d like. When you’re eating Real Food you don’t need to worry about how much of this or that is in each food, just enjoy! While I don’t use raw milk to make my yogurt, I did have that happen once: very runny consistancy, and no chunks or any setting-up at all. I discovered that my milk was too hot when I added it to my starter. You have to bring the milk down to about 120 degrees before adding it to room temp starter. Now, the other thing that might have happened is your starter was too cold (I take mine out in the morning and leave it on the counter until I am ready to make it late afternoon and evening.) I also incubate my yogurt right in a warm water bath on my stove with the burner off (it starts out around 120 and drops to around 90 after about 7-8 hours). Maybe one of these ideas will help you with your next batch! Good luck! After making yogert from raw milk for the first time last week I have a question. The first batch did not coagulate and remains close to the consistancy of milk. Second batch made yogert which seems to have a greater acid taste than the organic store milk I used previously. The question is what kind of milk product do I have with the first failed batch? Buttermilk or what? What else can I do with the failed batch? Use it to cook with or try to make yogert again? Nice web site! Are you sure the first batch didn’t set up at all? Or was it still thin in spots and chunky in spots? That’s how mine normally turns out, not totally set up. Then I use it for soaking grains in recipes or I strain it through a cheesecloth and get whey and a yogurt cheese as described in the “how to make whey” link above. If it didn’t set up at all maybe it wasn’t warm enough and for a long enough period of time? Temps make a big difference. Rich, what you have left is actually buttermilk. (You can make buttermilk like that or with a starter culture.) Here’s a post with more on that and what you can do with it: https://kellythekitchenkop.com/2008/10/how-to-make-whole-milk-raw-milk.html. It can be used in many of the same ways that whey can. I buy whole cows milk from a farmer and when we skim the cream and shake butter what can I do with the whey? Darla, have you seen these posts? Thank you so much for the quick reply! I was wondering because I have a few pounds to lose, so I am watching my calories. I didn’t know if I should should drink the kefir or the whey. I love both, but I sure can drink alot:) Thanks again! Sorry, I don’t know, but my best guess is “zero” for both! Why do you want to know? It’s so good for you, it really doesn’t matter, ya know? Kelly, I have been looking all over the internet to find the Calorie and fat Content of whey. I wondered it you would know? I make my own Kefir from grains and raw goat milk everyday. I have more than I know what to do with! Have a look on nutritiondata.com. It’s a super interesting site with the nutritional information for thousands of things. If you search whey you’ll find info on it. Sus.Eats/Annette – cool! Thanks for looking it up! BTW, cultured milk –> things like yogurt, buttermilk, kefir, etc. I just looked it up and he talks about using the whey right after making cheese. He says you can use whey from “cultured milk” whatever that is to ferment things. When he makes cheese, though he never heats the milk over 110 F so that the good bacteria isn’t destroyed. So it would seem that the deciding factor isn’t the rennet, it’s the temperature that you heat your milk to when you make cheese. I just made a gouda last night that didn’t go over 110 – in fact I’m pretty sure the tomme, monterey jack and montasio that I’ve made are all below 110 as well. Ricotta, however, goes above 110 so I should be throwing that whey out once I’ve used the mozzarella whey to make ricotta. Or feed it to the chickens. Does anyone have the “Wild Fermentation” book? I’ll bet the definitive answers to this would be in there…? My guess is if you heat it and use rennet like in the cheesemaking process it doesn’t develop all the same bugs (also you add new bugs to it to give it certain properties you want your cheese to have) but if you don’t do those things and simply let it separate into curds & whey of it’s own volition (like yogurt cheese, kefir cheese, etc) it’s golden. Katie said her pasteurized yogurt whey fermented her sweet potato fly just fine so it must still have enough umph in it. The yogurt whey did not have rennet added to it so maybe that is the deciding factor. What about the whey made from homemade yogurt, made from pasteurized, cream line milk?? Same as the whey from cheese?? Thanks Kelly. That makes total sense since you’ve altered the natural process by using rennet and then heated it up to add further insult. Here’s what I do: use the cheese whey for things you’ll be cooking anyway, like for part of the liquid in homemade bread. Use the raw whey for uncooked foods, like if you add a bit in your homemade ice cream or something. Sorry not to have more concrete answers for you! It’s nice to have friends in high places! Thanks so much – Wardeh was just wondering that on her blog as well so I’ll be sure and pass it on. Most of the liquid was olive oil which turned out to bitter so next time I plan to try 1/2 olive and 1/2 refined sesame oil. I don’t have any refined coconut oil or that would probably come out great too. It set up perfectly and works fine in salads though. My only concern with the cooked whey is that it’s greenish since whey (get it) more of the good stuff has been removed because the rennet does a great job. In fact, if you make ricotta with the whey it’s bright grass green and watery clear, like you put green food dye in water. There is probably not much left in it at that point. I want to use it to lacto-preserve things so it’s pretty important! Maybe I’ll just use the cheese whey for soaking grains and keep making whey from fresh raw milk for preservation purposes. I don’t want to make anyone sick. My husband is not quite on board with all this yet and that would be the last straw for him. One thing about using the whey in bread making – I’ve found that it takes almost an extra cup of flour for some reason and even then the dough is very sticky and won’t rise as well. It works great for pizza dough though since that doesn’t need to rise much. And it works great in pastry crust is the water replacement, ice cold from the fridge. Kelly, please post back if you find anything out. I had already looked through NT and she only mentions using whey from naturally separated dairy products, not whey from cheese making. My favorite way to whey is to drink it. Add a little salt and pepper. Think of it as a clear doogh or lassi. Good stuff. Martha- We had a cheesemaking workshop here in GR last year,by the Three Shepheards of the Mad River Valley, and they were talking about how there is a milk protein/milk fat bonding that goes on then making cheese, and if you notice white stuff in your whey, it is just that the cream content of that batch was higher than there was milk protein to bond to it. She said that if you notice that regularly, you can just skim a cup of cream from the milk before making the cheese, so that the extra cream doesn’t go to waste by ending up in the whey. That may be the issue. Good luck! Sus Eats, My whey is from regular store milk yogurt, and it’s done the job fermenting (just once, sweet potato fly), so I imagine you don’t have to have “raw” whey for the good stuff. At least all the protein is still in there, right? Sus.Eats – sorry, but I don’t know and I’m out of town so I can’t look at my Nour. Traditions book – I wonder if it would be in there? Does anyone else know? I actually have some “cooked” whey in the frig too and was wondering this. I have been assuming that it’s still beneficial to put in as the liquid when baking breads, etc., but probably not as beneficial as raw whey. Jeanne, let us know how it comes out in the rice. Thanks! Martha, sometimes mine will get drops of white coming through the cheesecloth that gives it a cloudy look, but I’m sure that’s still OK. Maybe that just happened a little more than it normally does for you for some reason? Did you use a different cheesebag than normal? Catherine, if you try fermenting apples, let us know how they fly with your kids! Katie, I’ve never tried the whey in smoothies, but if you do it first, let us know if it makes them sour-ish. If your whey is not pure and clear then the cheesecloth is the problem. 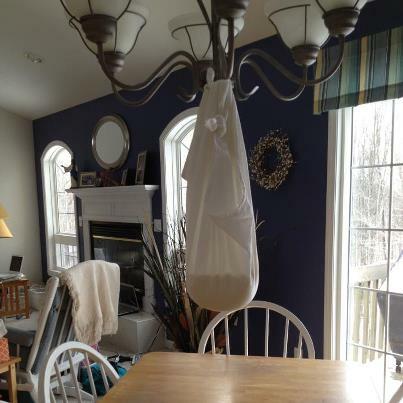 Try hanging in a cotton bag… search yogurt bags in amazon. there are several . 100% cotton is safe to use and does not let any of the white pass through with the whey. They you have perfect whey. I make whey fermented lemonade. …several recipes on the internet. 1 c fresh lemon juice, 1 cup whey 3/4 cup sugar, all in gal glass jug, add pure water to top, stir. Place on top of fridge for 2 days at least, then you have a delicious probiotic drink even the kids will like. Need to use sugar not stevia, since the sugar feeds the good bacteria to ferment. Much of the sugar is eaten in the fermenting, so 3/4 c sugar makes it only slightly sweet in the end. have fun . Love this idea. I needed this post! I have – literally – a gallon of whey in the fridge. I read you can bake bread with it, too, so I tried half and half with Kelly’s rolls. I either forgot a whole cup of flour, or whey changes the dough, but after kneading in a cup or so of flour, they turned out great! I don’t think my family will eat fermented veggies, but can you taste a sour tinge if you do smoothie cubes? Annette, do you mean the whey was the main liquid in the mayo? That would be interesting! Or you can make blaand, a Scottish fermented whey drink that has an alcohol content similar to wine. Great ideas! I particularly like the idea of making ice cubes for smoothies. I’ll have to try that. Thanks for mentioning fermenting apples! I was wondering which fruits I can ferment for my kids. I bought oranges for them but they are not crazy about oranges. Maybe a mix of apples, oranges and ginger! Yum. These are all great ideas! Thanks, Kelly, for sharing them. Happy Memorial Day Weekend to you & yours! P.S. I stumbled this very useful post. Everyone else should, too! Sue E. — Nourishing Traditions says that whey will keep for about 6 months in the fridge. When I separated my last batch of whey, it doesn’t look like it has in the past. It looks like watery milk, not whey. The bit that dripped out after hanging looks normal. The part that drained through the cloth and strainer does not. Does anybody know if this is still good? I’m thinking of straining it again to see if it clears up. I had my milk sitting out for at least four days before I tried it the first time. @Motherhen – thanks for the suggestion of using whey instead of buttermilk for ranch dressing. I have a new ranch dressing recipe I want to try out, but don’t have buttermilk on hand. But I do have some whey in the fridge! I’ve kept whey in the fridge for over a month and it was still good. I use whey in place of buttermilk. When I make Ranch dressing, I use whey. When I bake, I use the whey. I use it for fermenting and if I’m low on milk, I’ll add it to smoothies to stretch it out. I also use it to soak the oats for oatmeal, grits for breakfast and I’ll put it in my rice to soak with chicken stock. I don’t taste the tang and apparently, neither do my kids as they’ve not complained! I love the idea of freezing it in the icecube trays and then adding a little bit here and there. If you soak your brown rice in it does it change the flavor? I usually soak my rice in equal amount stock and water. Next time I am going to try the stock and whey. This may be one for your research team: I have whey that I make by leaving out the 1/2 gallon of raw milk for several days and then straining and I have whey left over from making cheese. The cheese whey has been heated and had the goodness artificially extracted by the use of rennet. Is it still able to produce the lactic acid preserving marvels that my naturally made whey does? I even made the SF mayonnaise with it (maybe I should call it whey-onnaise) and it thickened up and has retained it’s freshness after weeks – normal homemade mayonnaise w/o it would long have gone south and soupy. I have so much whey from making cheese I could bathe my family in it and I never know if it’s worth passing on to friends or not? Good for the garden? Feed to the dog? I love the idea of using it for a more sustainable mayonnaise! How do you use it for that? Sorry I just saw this!